We all know the story of Pinocchio, about a puppet who wanted to be a real boy. 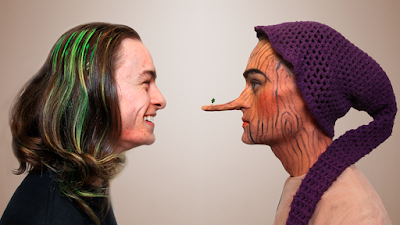 For this year's Melbourne Fringe Festival, emerging theatre company, A_tistic Theatre present Pinocchio Restrung, a re-imagined tale with Pinocchio's story used as an allegory of the life of an Autistic boy. Formed through Monash Uni Student Theatre (MUST) in 2014, the company aims to integrate the experience and understanding of autism spectrum disorder (ASD) into contemporary "spectrum theatre". "Spectrum theatre, came from a number of different influences, building one on top of the other," explains writer/director of the show, Tom Middleditch. "I was getting to the end of my Arts Degree, and wanted to put the knowledge I had gained through my study of philosophy and theatre to good and effective use. I was looking for a project to put on at MUST, and Artistic Director Yvonne Virsik suggested I look at devising something around Autism, of which I had expressed interest in the past, due to my own diagnosis on the spectrum." "The idea for Pinocchio Restrung came from a provocation that Sponge Bob was a potential autism candidate. That got me thinking of diagnosing classic fairy tale characters, and Pinocchio, being the “badly behaved boy” of the fairy tale world, immediately jumped out to me," he says. "I wrote it as a note, and didn’t immediately pursue it further. I only really started pushing the idea when I mentioned it to a few people who are fairly tough on my ideas, and they liked the idea as it was then, which gave me the confidence to believe it was an idea worth following." "In working with Co-director Jess Gonsalvez, we came to realise the potential for developing a theatre style dedicated specifically to the experiences of those on the spectrum. Perhaps most importantly, this theatre style allowed me to interrogate my own opinion and understanding of the cultural phenomenon of autism, to which I have a place in, in a manner that went above and beyond my own interests. I'm hoping it will be of benefit to many other people and can ultimately leave my hands and become a tool for other theatre makers to take and mould as they wish." A very successful pozible campaign for Pinocchio Restrung saw A_tistic exceed its target by 66%, showing there is an audience out there that want to see these types of shows, yet there are so few that deal with autism or other developmental conditions. "The biggest reason why this is so is, definitely, taboo. Mental health and disability are taboo on their own, and Autism is an intersection of these two fields, and thus very deeply taboo," explains Middleditch. "Autism is one of the biggest magnets for pseudoscience, and pop culture attitudes to what an Autistic person should and shouldn’t be are very scary stereotypes to go up against. Given the real world impact of ASD as well, it takes a definitive nerve to tackle this material." "Knowledge of the spectrum is also a barrier for creators. Autism sits in this constantly shifting place between psychology, advocacy, pop culture, and family dynamics. This area covers a huge swathe of human knowledge, which one needs to have a grasp on in order to even begin to seriously consider a work discussing ASD properly. With these three barriers in place, the final decider is a confidence in the creators from the audience. I think our pozible gave people confidence that we knew what we were doing." While Middleditch is confident that audiences will enjoy the story they are being told in the way it's being told, he's hoping they will also walk away with more awareness of what autism can actually encompass. "I'd like people to empathise with a character whose experience is both fantastically different and yet remarkably close to our own, and that those on the spectrum can see a new story of theirs being told, that they can see there is space for their stories to also be told. We have always been here, and are hidden through the pages of history and fantasy, if you know how and where to look for us." The most irritating habit I have is getting stressed when I have to wait to eat cooked food that is in front of me. “Send Me On My Way” by The Rusted Roots. During Fringe, I really, really, really want to start breaking the taboo of mentioning Autism, and have audiences walk out saying the word when they may not have said it before.